Both easy to prepare and delicious to eat, this shepherd’s pie with cheese is a huge crowd-pleaser - you won’t need any other recipe for shepherd’s pie once you make this one! With turnip that adds a touch of sweetness, cinnamon that perfectly complements the meat (ground lamb is traditional, but ground beef also works well), and rich cheddar topped potatoes, this is the ultimate comfort food. You’ll want to share this one with family and friends on Facebook, Pinterest, Instagram, and Twitter. Get your ingredients ready, watch the video demonstration below, and then get started. First, make the meat filling by heating olive oil in a large skillet over medium heat. Add the diced onions and cook, stirring, for about 5 minutes (until golden brown). Add in the carrots and turnip and cook 5 more minutes. Put vegetables in a bowl and set aside. Add ground lamb (or beef) to skillet and cook until well browned. Stir in thyme and cinnamon and add vegetables back in. Add in the flour and thoroughly mix, gradually stirring in the broth (or beer), followed by the tomato paste. Reduce heat to maintain a gentle simmer, cover skillet, and let mixture simmer for about 30 minutes. Season with salt and pepper to taste. Now it’s time to make the topping! Steam cut potatoes until tender, approximately 20 minutes. Then place in a bowl, add Cabot Salted Butter, and mash (by hand or with an electric whisk). Season with salt and white pepper to taste. Preheat oven to 400°F. Spoon the meat filling into a baking dish and spread the mashed potato mixture evenly over the top. 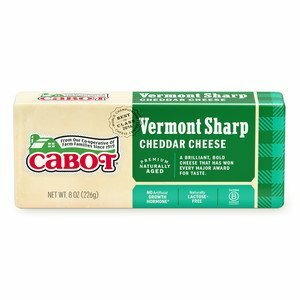 Scatter Cabot Sharp Shredded Cheddar cheese over the potatoes and bake until top is golden and filling is bubbling, about 25 minutes. For another hearty, delicious, and easy to prepare recipe, try this Ham and Mushroom Pizza Bake. 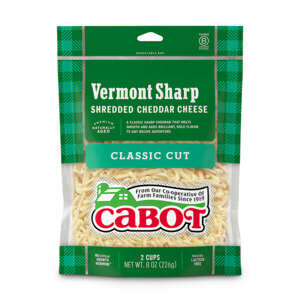 Cabot is a cooperative of over 800 farm families who all work diligently to produce only the highest quality products. 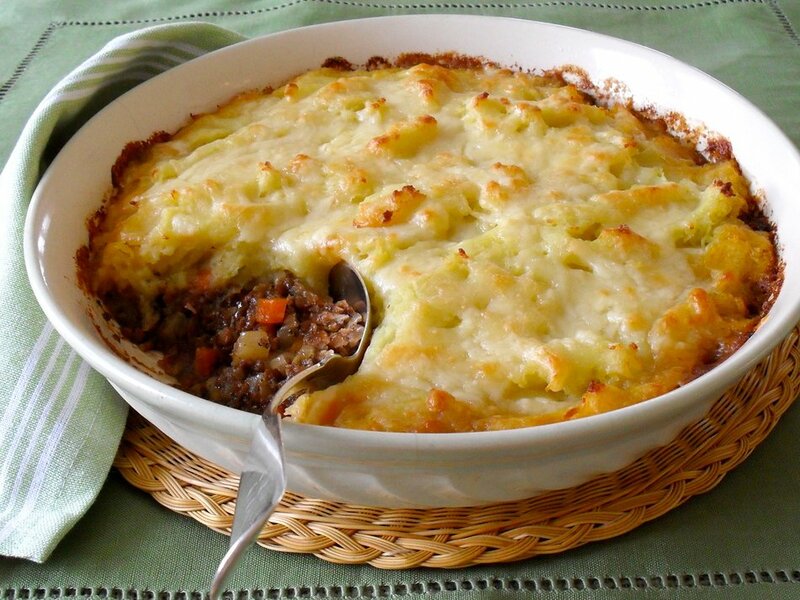 We’d love for you to share your thoughts about this shepherd’s pie with cheese recipe so, if you could rate and review it once you’ve tried it, we’d really appreciate it! HEAT oil in large skillet over medium heat. Add onions and cook, stirring, until they begin to turn golden brown, about 5 minutes. ADD carrots and turnip and cook for another 5 minutes. Transfer vegetables to bowl and set aside. RETURN skillet to heat and add lamb or beef; cook, breaking up meat with spoon, until very well browned. Stir in thyme and cinnamon. Return vegetables to skillet. ADD flour and mix in thoroughly. Gradually stir in broth or beer, then tomato paste. LOWER heat to maintain gentle simmer, cover skillet and let mixture simmer for about 30 minutes. Season with salt and pepper. CUT potatoes into even-sized pieces. Place in steamer set in pan of boiling water; cover and steam until tender, about 20 minutes. TRANSFER potatoes to bowl, add butter and mash by hand or with electric whisk. Season with salt and white pepper. PREHEAT oven to 400°F. Spoon filling into baking dish. Spread potato mixture evenly on top. Scatter cheese over potatoes. BAKE for 25 minutes, or until top is golden and crusty. Absolutely delicious! First time making proper Shepherd's Pie. Funny thing is that yesterday was the first time I had even heard of Harpoon Beer (we live in FL). There was a six pack of Harpoon Flannel Friday at our local grocery, and I was able to use one in the Shepherd's Pie! Thank you. Absolutely love this dish made with ground lamb! The turnip adds a hint of sweetness and the cheddar topped potatoes are the crowning touch! Excellent recipe! One of my fall favorites. Very easy, very good. Modified using half beef/turkey to lighten it a bit, but doubled the cheese! Cinnamon was nice, but maybe a pinch too much. Great Recipe! Easy to prepare and delicious. The cinnamon works wonderfully with the meat.